Do you think Mage will recover?? Give the meta more than 2 days. Maybe people are playing a very popular bad deck hmm *thinking* Warrior is straight forward to build you search bomb -> add all, search mech-> add boom gg 55+% wr. btw if you open mage decks you will see some 50% + decks. The meta needs to settle. Bomb Warrior actually works because it had a decent rush (midrange tempo, or control) shell earlier, but OP'ness of other decks held it down. It's pretty much an old build with bomb mechanics, that turned out to sync well. Plus it's win condition is pretty straightforward and synergizes well with Warrior's class concept. It's something similar to Witchwood Odd Rogue - it was natural that it would happen fast. Also, 3 days post launch is a bit early to call dibs on Mage being garbage. We might get a deck that will prey on Bomb Warr, which will shake the meta up, and then Mage can find a spot. We ALWAYS have a tempo-ish Mage deck that's either low Tier 1 or high Tier 2 that is nice for laddering and I'm expecting something similar now. What actually surprises me in that pic OP posted is low winrate for Rogues - really? I've thought that Tempo Rogue was pretty much dominant with multiple players hitting #1 with Heistbaron Tempo? I've played it yesterday to get to R5 fast (from R8 no stars, over 80% winrate - lost to one Bomb Warr, but had crap draws, and some mirrors), but now I hopped onto Bomb Warr myself, as I've really wanted to try it out. I dont see the hype about Bomb Warrior. Won vs it with Priest, Rouge, Hunter. And since every metagame is following "THE BIG BADASS DECK" you have to think outside the box. Bombs can be outplayed so do it! Remember when Cubelock got nerfed and Warlock became "garbage class" a few expansion ago? Couple weeks later HealZoo got posted and suddenly it was OP. There could very well be a sleeper mage deck that will be strong enough. Who knows? Besides, looking at win rates on things like HSReplay are useless because they get skewed by netdeckers. If all the brainless play bomb warrior (an easy deck to pilot) because X streamer is doing so, of course it'll have a high win rate. 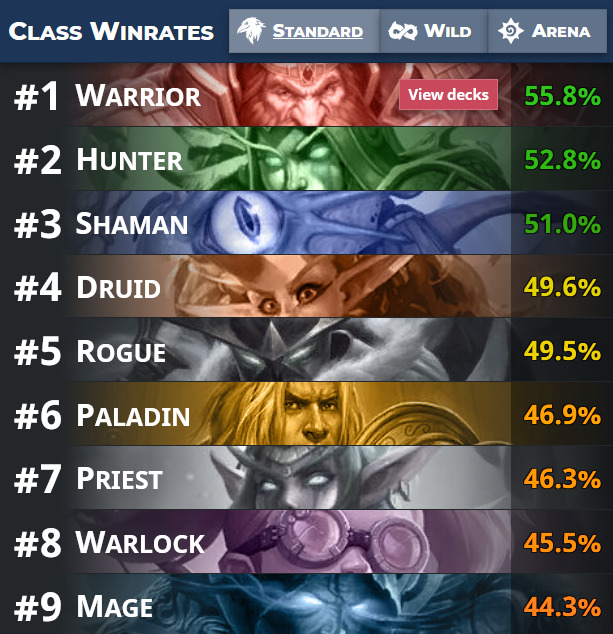 If everyone playing Mage are experimenting with numerous archetypes and synergies because no streamer plays it, of course the win rate will be low. I dunno. I've been playing mage and beaten plenty of warriors. They only have a couple of board clears so just keep the pressure up. Astromancer and Khadgar are your friends ;) atm Warr has only 2x Warpath and 2x Brawl. Playing ,Spell Hunter and Ress Priest, im having pretty good games so far. I still think its early to say, what will be good and what will be bad. I would wait at least week or two. Or for Vicious Syndicate snapshot. It‘s way to early for this kind of topic.. I even had good success with a random mech paladin, combining hecklebot and kangors endless army! Bomb warriors have multiple weak tempo cards that can be punished by allmost everything that‘s somewhat decent. Bombs don‘t matter before turn 15. Only good thing about this deck is the rush package and blastmaster boom. Calm down. Stop putting so much stock those numbers, they don't tell the whole story. Ofc. is Weenie Warlock now OP !! NERF WARLOCK NOW 111111!!! Who said it was OP?